If you love Disney Pixar and crafting, you've come to the right place! We have an entire month of fun planned for you, with a new group of crafting bloggers every Saturday in June. If you came here from Cathie's's blog, then you are in the right place. If you just happened upon this Blog Hop, make sure to head over to Shawn's blog so that you see the full hop from the very beginning. If you missed the first two weekends, you can still go back and see all of those projects too. Just click HERE to see the projects from the first weekend, and click HERE to see the projects from the second weekend. I created one of the very popular, current "box cards". 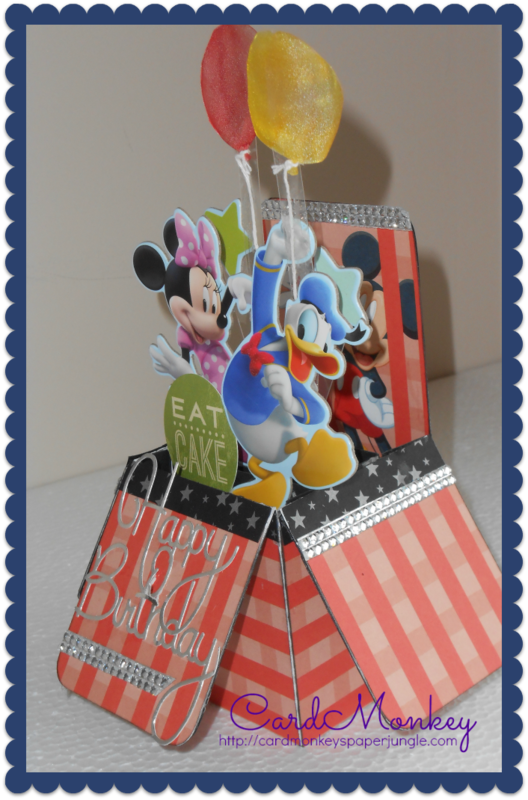 This gem folds flat for mailing, and opens up to show a Disney birthday party! I used a 6" x 11.5" template to make the card base. The cute plaid paper was from a very large box of Disney stash papers I've accumulated over the years, as is the black matte paper with silver stars shown on the edge. The characters shown (Minnie and Donald) along with the stars are chipboard elements I purchased at Michael's. The "eat cake" element is from Jillibean Soup. And I cut the silver "Happy Birthday" using my Silhouette Cameo with a Silhouette file. The very special elements I used here came from two of our sponsors: The Buckle Boutique and Rowlux Illusion film. From TBB, I used clear Dazzling Diamonds resin rhinestone cut in strips two rows high and adhered to the flip panels. I used the Illusion film (clear bubble) to cut the balloons and I colored them with Copic markers. YES, coloring/tinting works great!!! Make sure to mark your calendar for MORE projects next Saturday! You can join the Facebook Event page by clicking HERE. This week, I am the last stop on this fantastic hop. Be sure to come back to visit the Disney Pixar Blog Hop EVERY Saturday in June. Each day's starts with Shawn Mosch; she will post a list of each week's participants on each Saturday. Have yourself a fantastimagical day! Great card, perfect papers. Very creative. Great card...love all of the characters! I love the box card!! These card boxes are so cool. I really love your Disney one! great job! I love these box cards! Yours turned out great! I call these "box cards" "explosion boxes" but yours is to die for! Fabulous colors and so perfectly made! You are very skilled at what you do! I am in awe!